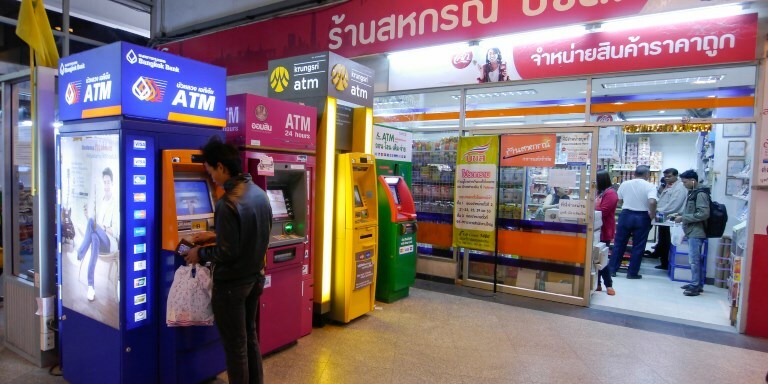 New digital technologies are a game changer for financial inclusion in Asia, opening up access to financial services for all sectors of society, and in the process helping dispel myths about financial inclusion. Financial inclusion matters to economic growth. Having access to financial services means that people can make payments, get credit, save and invest. This contributes to increased spending on goods and services and creates a virtuous cycle where more consumption translates into increased production, more jobs, higher incomes, and greater economic prosperity. However, providing access to financial services involves much more than simply helping people open a bank account. Adoption of selected traditional and digital financial services. Here are 10 myths on financial inclusion that need to be dispelled so opportunities for those who are financially excluded can be unlocked. Being the most dynamic region in the world, Asia has the least number of people who are financially excluded or unbanked. * The Global Findex Database 2014 Measuring Financial Inclusion around the World. People who have bank accounts use financial products and services often. There are more women who own a bank account than men. Globally, only 58% of women have a bank account, compared to 65% of men, and on a regional basis, the gender gap in account ownership is largest in South Asia (55% of men vs 37% of women). There are a few country exceptions to this, including the Philippines. People need to own a bank account to be “banked” or financially included. Broadly defined, “financial inclusion” means access to and usage of appropriate, affordable, and accessible financial services such as savings, payments, remittances, credit, insurance and investments. Payments are a key entry point to supporting financial inclusion. Digital government-to-people (G2P) payments and remittance flows have, for example, created the initial momentum for electronic payments. This is the case for G2P payments in India and remittance flows in the Philippines. New players can offer transactional financial accounts from a variety of licensed non-bank financial institutions such as payment banks in India, specialized banks in Cambodia as well as electronic money issuers such as in the Philippines where electronic banking started in 2001. Digital technology benefits only the "banked" or the financially included as they can transact electronically through banks. Technological innovations are revolutionizing the financial industry and with new digital applications there is now no need for a bank account, high-tech devices, or high levels of knowledge. Digital technology is the “cure-all” solution for bringing financial services to people and business more conveniently and faster than in the past. Technology is only good when people use it because it solves a specific problem for them. To reach the base of the pyramid—the last mile—financial service providers must first address the two barriers: Identity verification (demand side), and accessing financial services (supply side). Without proof of identity, the "unbanked" cannot become financially included. There are approximately 1.5 billion people globally—the majority of whom live in Asia and Africa—who cannot prove their official identity or lack official forms of identification. Not having an official identity cuts them off from basic services, including opening a bank account. New technologies are helping to change the way financial service providers can gather information for identity verification. In India, for example, the Aadhaar identification system uses biometrics for customer verification. With the Aadhaar system, the number of people in India with national identification has reached over 1 billion. People living in rural or remote areas where there is no access to ATMs or banks cannot be financially included. With innovations in digital financial services, service providers can offer basic services through mobile phones, point-of-sale devices and agent networks, removing the need for bank branches and ATM access. E-commerce businesses, in partnership with banks, are also driving financial inclusion in new ways. Examples include Alibaba.com in the People's Republic of China, and Southeast Asian-based company, Lazada.com. The "unbanked" cannot access credit because they do not have formal income, credit history, collateral or personal identification. This makes it difficult for lenders to understand their risk profile and assess their creditworthiness. Digital technology enables clients to do financial transactions online, via for example, a mobile phone, and through the use of social networks. This also leaves digital footprints, which provide new ways to assess credit risk. Such information makes it possible for excluded potential borrowers to access formal credit. An example is the millions of small and medium-sized enterprises who have access to near-instant credit from Ant Financial in China. This is done by utilizing analysis of e-commerce sales histories on Alibaba.com. Digital finance makes the jobs of regulators difficult, as they lose control over the financial system. New technology gives regulators access to more real-time financial data, helping them to carry out their supervisory role more effectively. Brookings. 2016. The 2016 Brookings Financial and Digital Inclusion Project Report. M. Ayyagari and T. Beck. 2015.Financial Inclusion in Asia: An Overview. ADB Economics Working Paper Series. No.449. Manila. Asian Development Bank. Wall Street Journal video. What is Financial Inclusion. McKinsey & Company. 2016. Digital Finance for all: Powering Inclusive Growth in Emerging Economies. Global Database on Financial Inclusion. The Global Findex Database 2014.